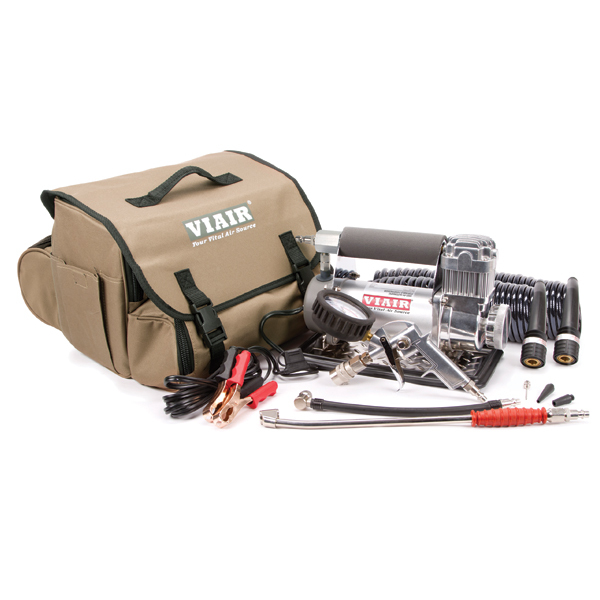 The Viair 400P-RV Automatic Portable Compressor Kit is the third and best tire inflation system that we've owned. It's solidly built and heavy for its size. It's approximate size is 14 x 10.2 x 16.7 and that's packed inside its bag with all its attachments. It comes with all the attachments you'll need right out of the box including 60 feet of pressure hose, a gun style inflator with gauge, and a carry bag. Our first compressor was fine for a car, but wouldn't inflate our RV tires. It would only go up to around 60psi. Our second compressor was big and heavy so it would easily inflate our RV tires, but it was really meant for a construction site and not an RV. The Viair 400P-RV compressor is just perfect for our RV and car. However, our experience is that its gauge is inaccurate just like the previous two compressors we've owned. We keep the Viair 400P-RV compressor in our car (toad) so it's always with us even when we're off exploring in the car. The compressor's smallish tote bag makes it easy to stow in your trunk. And it has come in very handy a few times because we've had slow leaks in three of our car tires. The compressor attaches to your car or coach battery with a power cable with two alligator clips that is long enough to set the unit on the ground while running. It is also highly recommended that you run your car engine or coach battery charger while using the Viair 400P-RV. It pulls a lot of power (see specs below) and can quickly kill your batteries. We've always used our car battery since its easier to get to and we can move the car to get in close to where we need the compressor even though the compressor comes with 60 feet of pressure line (two 30 foot sections). We've only used one of the 30 foot lines and simply moved the car. As compressors go, it's quieter than others that I've heard and is quieter than our previous two. It's still noisy, but all in all it's not that bad. It does get hot to the touch and so after a hard working session you'll want to let it cool down before stowing it away. We've tested it twice on our coach after I let out too much air from a couple of tires. It took the tires up to 120psi effortlessly. The Viair 400P-RV is rated to 150psi, but we'll never actually be able to test that. It comes with two chucks (the part that attaches to the tire's stem) that you can select to attach to the inflation gun. One is a 90 degree screw on chuck that we have never used. I think this would be more for inflating a bicycle tire. The other one is an extended 45 degree chuck for those hard to reach tire stems and is what you're used to seeing at gas stations. One of the best features of the Viair 400P-RV compressor is the "Automatic Shut Off." What this means is that when you release the gun inflator's trigger, the compress stops running. This is very nice (and quiet) while you check you're tire's pressure and/or move from one tire to another. Our past two compressors would run continuously until you turned them off. After having the Viair 400P-RV compressor for a while now and using it a half dozen times or so, I'm very happy with its functionality and quality. Its small size and somewhat quiet operation makes it easy to use and not too disturbing to your neighbors. I also like that it comes with everything you need to use the compressor including two types of chucks and 60 feet of pressure line. Nice! The one thing I'd recommend that you add to the Viair 400P-RV compressor kit is a high quality hand held tire pressure gauge. These gauges are cheap and easy to find at any auto parts store or on Amazon. If you found this review helpful, please consider using our Amazon link above or below to shop on Amazon. If you make a purchase, we may earn a small commission from Amazon but it won’t cost you any more. Thanks!